did you ever eat peaches and cottage cheese as a child? well, this recipe takes it to a whole new level. 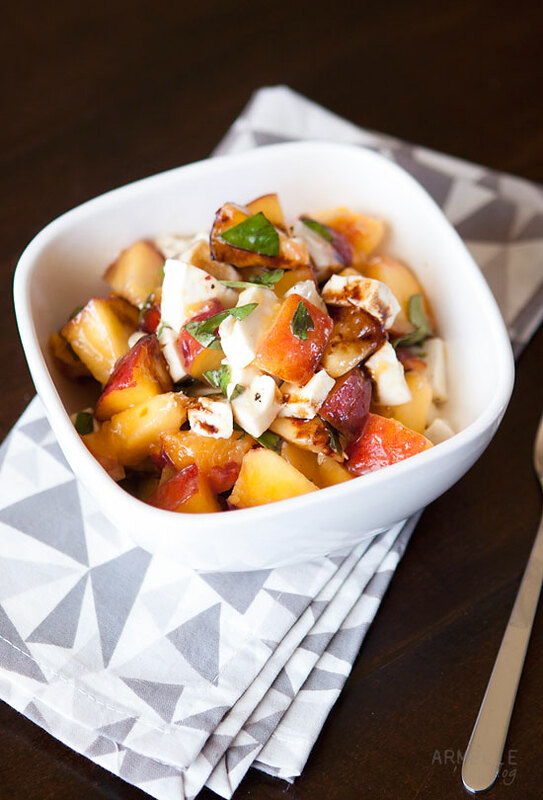 my friend leah served a peach, mozzarella, and basil salad at our recent book club, and it was down right amazing! i drizzled a little balsamic honey reduction over the top, and it was out of this world! In a small sauce pan, combine balsamic vinegar and honey and whisk together while bringing to a boil. Whisk as it reduces by half, and remove from heat. When ready to serve, drizzle with a little bit of the balsamic honey reduction. Wow what a nice post.I loved it……..! It is wonderful post.I am felling glad on this post.Can you more share with me. Never thought of mixing peaches with mozzeralla but it sounds mouth watering! that looks amazing! such a different combination but sounds so good! I LOVE this recipe. I made it last summer & we are going peach picking today! I want to make it for dinner, but the recipe link does not work anymore. It takes me to drop biscuits. Please help! I posted the recipe above!